Allahabad Agricultural Institute, which is now known as (SHUATS) or Sam Higginbottom university of Agricultural Technology and Sciences has a Christian Training program. This is a UGC (University Gran Commission) accredited deemed university which has been regularized by UP govt, run by Yogi Aditya Nath. 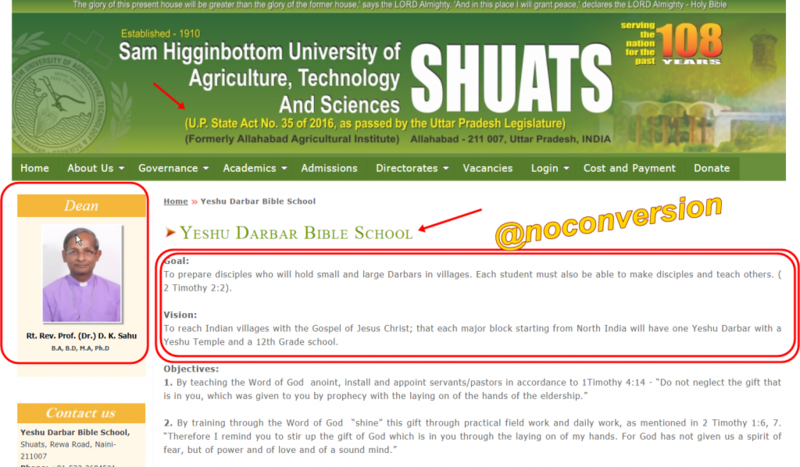 They have a formal training program on Christian Theology and an institute which is called “Yeshu Darbar”. Somebody needs to investigate when the name of University is Agricultural, Technology, and Science Why are they teaching Bible programs?